Mercedes-Benz has given its baby A Class a makeover. 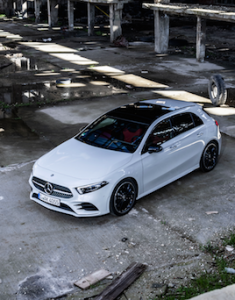 The fourth generation hatchback looks the business and is full of technology. A high tech double screen interior and dashboard layout is the star attraction of the 20 year old model. 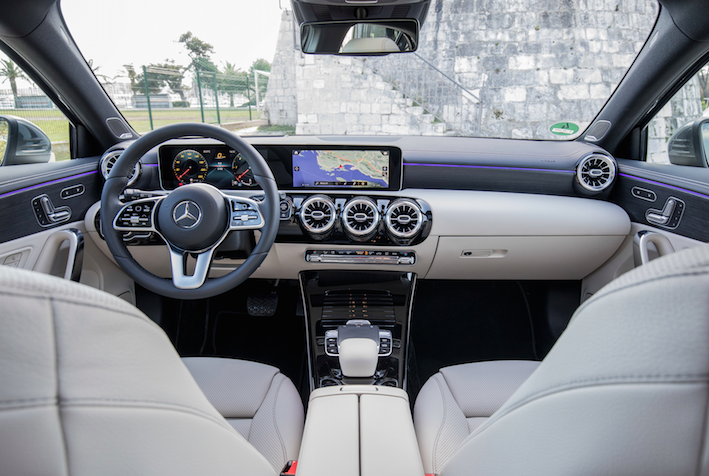 Mercedes-Benz impressive MBUX (Mercedes Benz user experience) and its connective technology is very much to the fore and standard fit. For once the entry model in Merc’s range gets some new toys before the S Class. Traditionally bits filter down from the S Class to lesser machines in Stuttgart’s line up. So its all good then? Sadly no. The dynamic driving experience in the premium compact hatch is far from interesting… read on. The engine range includes a 1.33 litre (A200) and 2 litre (A250) petrol models, and a single 1,461cc diesel unit. My front wheel drive A180d AMG Line automatic diesel (Renault sourced 1.5 litre) is an economical machine with low emissions (from 108g/CO2 or 111g/CO2 version tested). Power output is a less than thrilling 116hp, but the torque figure is more like it at 260nm. I can’t say I enjoyed a premium driving experience. 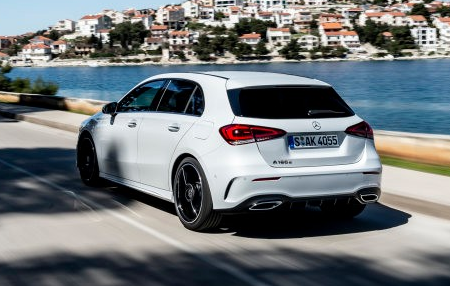 There are a couple of reasons for this: the 7-speed auto gearbox is lazy and slow to react, and the second is the relatively high level of road noise in the cabin. More sound insulation is needed and the great looking 18 inch 5 spoke AMG alloys and tyre combination fitted on my test car come at the cost of refinement. The road noise generated is simply too high for a premium machine. I got out of the new KIA CEED and into the A Class and the Slovakian built Korean machine was much quieter on the road – albeit on smaller rims. 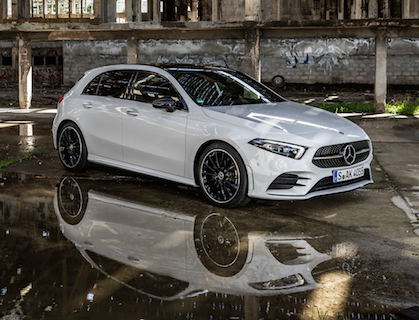 The fact that the A Class cabin is so beautifully appointed only draws attention to this audible failing and for €35,505 in this case (excluding options), I feel pretty peeved. 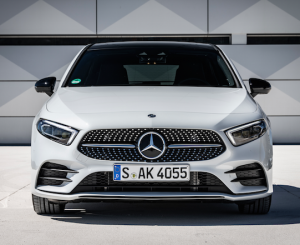 The A Class’s longer exterior features a front end that always catches me out when it appears in my rear view mirror – the car looks like a larger machine with its beautiful grille and wide stance. The exterior changes are subtle but as a design form the little Mercedes is very pretty. 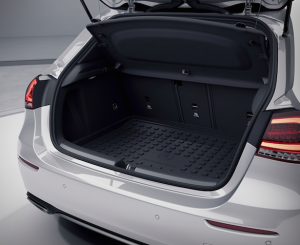 With the adoption of a new torsion beam rear suspension set up Mercedes has been able to make more room in the boot. The enlarged boot can now take golf clubs (some people I believe like this spoiled walk) holding a reasonable 370 litres. A more sophisticated and capable multi-link rear suspension comes with more powerful versions. Inside, the five seater its revised cabin has a wow factor that makes its rivals looked very dated. The multi-function steering wheel is shared with the S class and the controls are all familiar to MB owners. The gear selector is on the right hand stalk and there is a push button parking brake to the right of the leather wrapped wheel. Cruise control is standard but I also had the optional speed limit assist (€471) to help ease me along my way in a compliant manner. 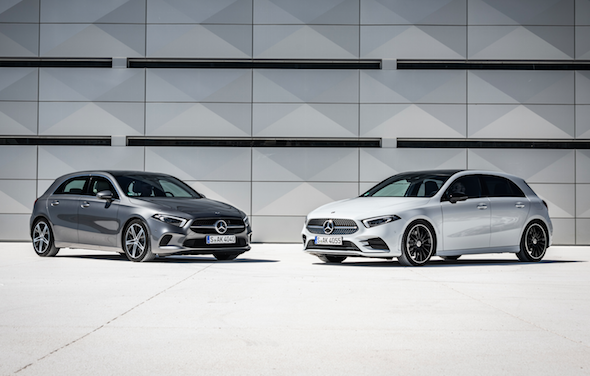 Some of the cool tech available with the new A Class and its new wiring loom includes: being able to use the phrase “Hey Mercedes” much like Hey Alexa or Siri to interact with the car’s functions and access the internet. This works better than most voice activated systems currently available as it is programmed to react to normal speach and phrasing. I found it useful when interacting with the sat nav. Another piece of cool that will be on every car in the coming years concerns advanced connectivity. Optional augmented reality overlays are available with the sat nav – much like Pokemon Go. You can open and start the car with your smartphone (or using a near field communication card NFC). You can even let someone access and use your car via remotely an app. Mercedes will even let your car spy out empty parking spaces (via the park assist camera) and lets other Mercs in the area know they’re free… very James Bond! 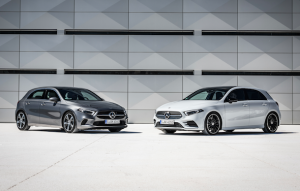 Mercedes-Benz Ireland says the A Class is the tipping point for the brand to get to the younger generation going forward. 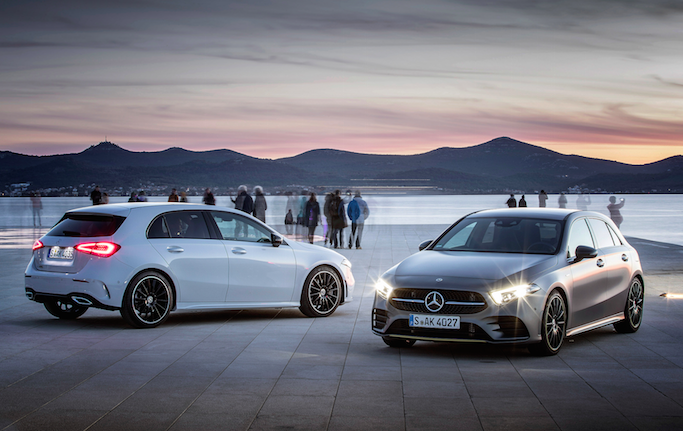 Three design lines feature rising to level two Progressive with AMG Line topping the range. Manual gearbox versions are on the way as are A160 petrol and A160 diesel versions from circa €30K depending on results from the new WLTP tests. Petrol power is the way to go for a quieter life unless your a high mileage user. The A200 pushes out a healthy 163hp/250nm. The new A Class sets the bar for tech and that makes it pretty cool and desirable.